The Alabama team from Russellville has won first place in the TARC finals. 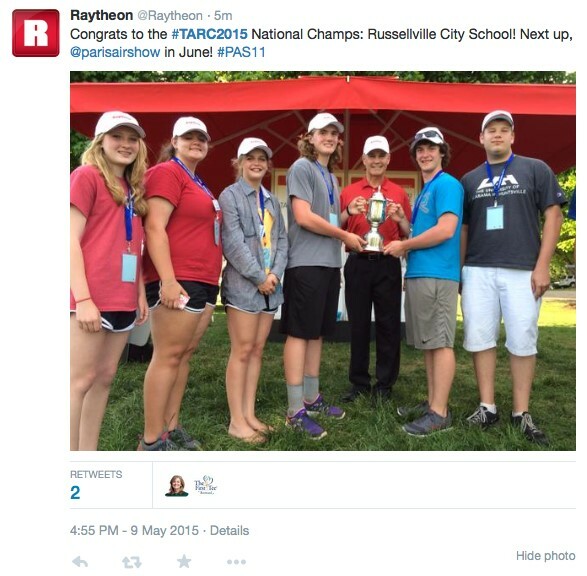 They receive a cash prize of $20k and will be traveling to Paris in June as the guests of the Raytheon Company representing the United States to fly against the winners of the TARC-equivalent event in the UK and France at the Paris Air Show, which is the biggest aerospace show and exhibition in the world in 2015. 695 teams (representing over 5000 students) entered TARC 2015 from 48 states, 459 teams made at least one qualification flight attempt (66%, a record high percentage), and the 101 teams that came to the Finals represented 28 states plus the US Virgin Islands. Congratulations to the Russellville team on their decisive win with flights scores of 12 and 4 to total 16. Second place was 33 and third was 37. This is the first Alabama team to win the TARC championship. The next best was Bob Jones that came in third nationally in 2010, John Paul II was fourth in 2013 and Liberty Middle fifth in 2012.